Paul Sandby (1725-1809) was one of the most influential English watercolour artists of his time. As a young man he was trained in the draughtsmanship of military maps and plans at the Tower of London. He was appointed draughtsman to the Board of Ordnance's survey of the Highlands in 1746. 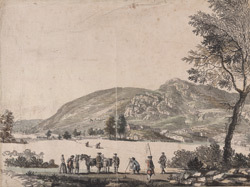 This picture of a surveying party at Loch Rannoch was painted at this time, before he left Scotland in 1751. Sandby's early watercolours show much of the neatness and careful observation instilled in him from his military training. He is mostly remembered for his landscape style - neat, unobtrusive ink outlines, a base layer of grey, with blue-green foliage built up in a series of short, curved brush strokes. He uses a splash of red for the figures in the picture. His style was widely copied by later artists.